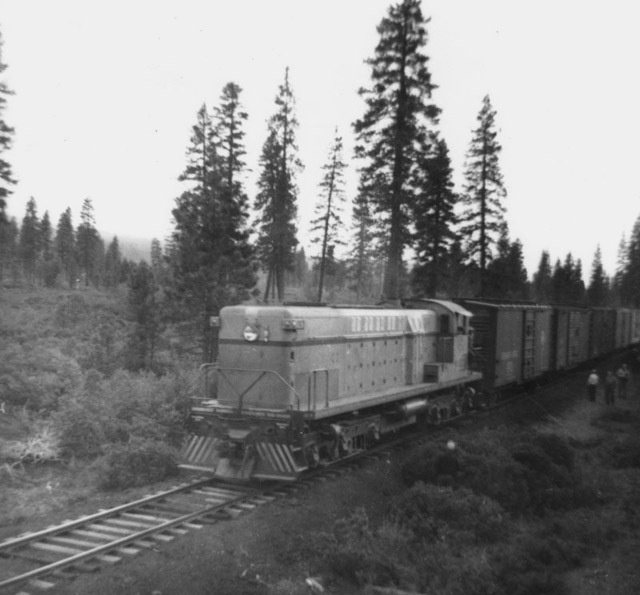 The entire reason for the existence of the Lookout Job was to take all freight to or from from McCloud to the eastern connections at Lookout Junction. This job used to run daily from the time the line was opened in 1939 until about 1979. 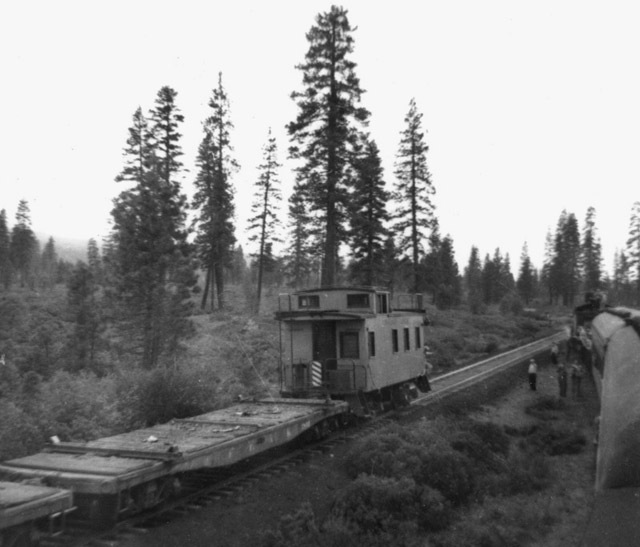 From 1939 up until 1951 the consist was swelled by loaded log cars bound for McCloud. From about 1980 until about 1990 the Lookout Job generally ran once every two to three weeks. This changed in the late 1980’s when inbound paper started coming in from Lookout to a warehouse and rail-to-truck reload facility at McCloud, and operations over the line increased to 2-4 trains a week. However, the paper traffic disappeared by the middle of 1998, and operations afterwards dropped to one train a week or less, with train lengths averaging 1 to 6 cars per trip. In late 2003, BNSF struck a haulage agreement with Union Pacific that sees McCloud-BNSF interchange traffic handled by the Union Pacific between the McCloud at Mt. Shasta City and BNSF at Klamath Falls, Oregon. The last train to Lookout ran on 16 December 2003. BNSF abandoned the Hambone to Lookout trackage in 2005, and the McCloud Railway removed the Bartle to Hambone trackage in 2008. #16 rolling eastbound lumber loads through White Horse. From the T.E. "Eddy" Glover collection. 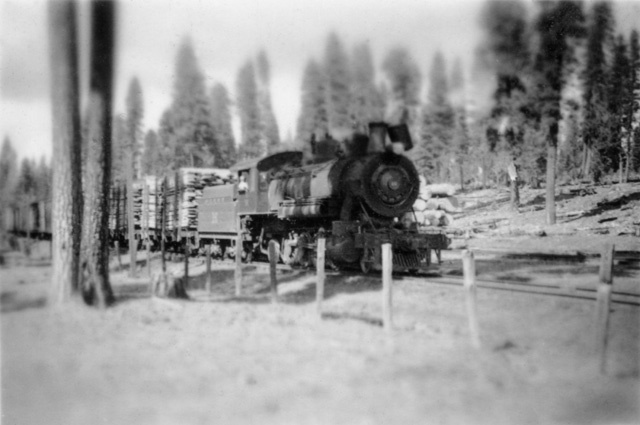 An almost new #28 leading an eastbound train bound for Lookout through Camp No. 2 on 10 June 1950. 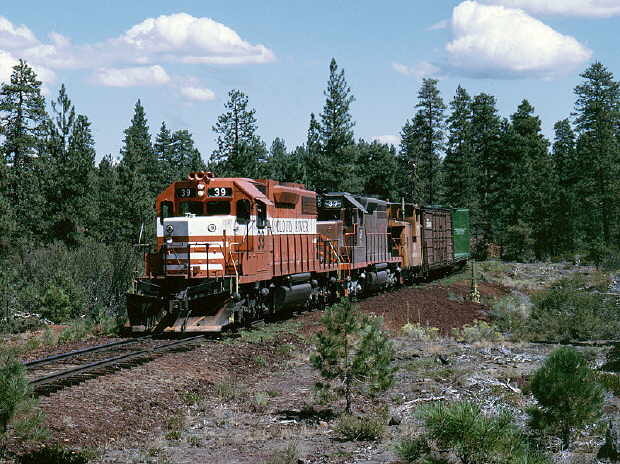 The freight is passing a railfan excursion returning westbound to McCloud. Jeff Moore collection. An ex-Great Northern caboose bringing up the rear of the Lookout Job on 10 June 1950. 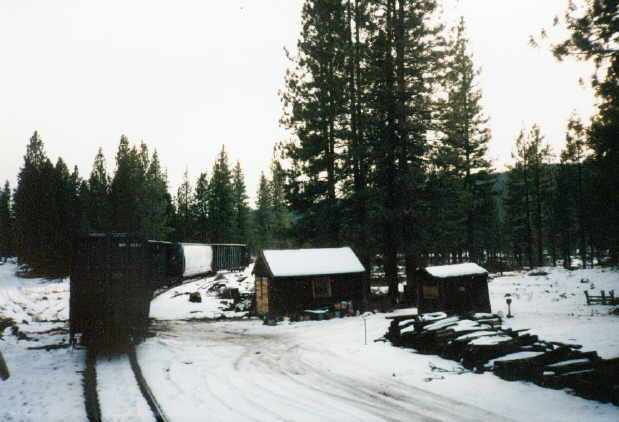 The log flats in front of the caboose are destined for the lumber company at Spur 526, where they will be taken on to the Widow Valley camp for loading. Jeff Moore collection. This photo shows an eastbound Lookout bound freight near Kinyon in July 1984. Photo is © Mike Woodruff and is used here with permission. This photo shows the same train as the previous photo, but near White Horse. Photo is © Mike Woodruff and is shown here with permission. This photo shows a train returning from Lookout near Chippy Spur. Photo is © Mike Woodruff and is shown here with permission. 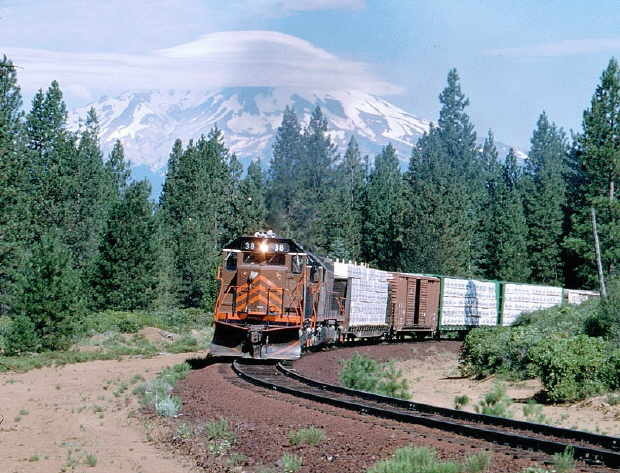 Photo shows a short westbound train returning from Lookout near Car A in 2002. Photo is © Sean Zwagerman and is used with permission. 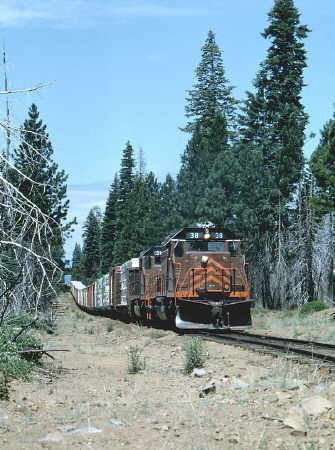 A typical consist of a Lookout freight in the last years of operation.